Watch the teaser trailer for this season's GvG rewards, including the first glimpse of Conquerors' Hall. With the third and final Invasion Day of GvG Season 4 now over, the season enters its high-stakes final stretch: all season points earned are now doubled, and the throne is still anyone's to claim. And starting this season, winning guilds will receive exclusive rewards including different tiers of the Battle Rhino mount and a permanent spot in Conquerors' Hall. 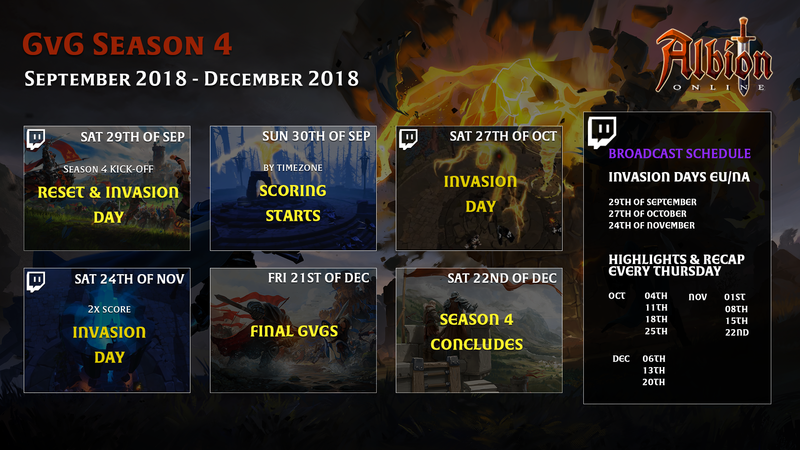 GvG Season 4 ends on Saturday, December 22. You can view the current season standings ingame under Rankings → Season Rankings, and be sure to watch weekly GvG highlights every Thursday at 18:00 UTC on AlbionTV. Focus amount for t7 swamp lizard and t7 direboar.